This Robotic Process Automation tutorial will help you learn RPA and be a certified RPA professional. This RPA tutorial includes various aspects of RPA process, architecture of RPA, various tools used in RPA, significance of UiPath tool, workflow and Citrix automation, screen scraping, UiPath coding and debugging. Learn RPA from Intellipaat RPA course and fast-track your career. This Robotic Process Automation (RPA) tutorial you will be able to get an clear idea about robotic process automation, different tools in RPA, lifecycle of RPA, how to deploy UiPath tool, Components of UiPath, UI Automation, working on UiPath Studio, UiPath coding & debugging, Screen Scraping and Citrix Automation. RPA is a business process automation technology based on combination of its predecessors. It is highly dependent on screen scraping and workflow automation and it is built on Artificial intelligence. Robotic process automation (RPA) is a type of software that is used to do automation of fundamental tasks in software applications like how a human performs it. The software robot can be educated a workflow/process with different steps & applications, for example, taking received forms, sending a receipt message, checking the forms for completeness, documenting the form in a folder and updating a spreadsheet with the form name, the date recorded, etc. RPA programming is intended to diminish the weight of monotonous, straightforward tasks/work on workers. McKinsey & Company uses RPA and suggests that up to 45% of activities can be automated using RPA. It uses RPA to automate tasks such as data migration, copy-paste tasks and order processing etc.. RPA is expected to be equivalent to the output of between 110 million- 140 million workers. According to Institute for Robotic Process Automation, a RPA software robot costs about one third price of an full time employee, it can be cost effective for the companies that can manage all the their activities. Deloitte also uses RPA software bot and it is capable of performing a list of more than 600 actions in a given sequence. The Research by Transparency Market Research says that RPA is expected a compounded annual growth rate of 60.5% worldwide through 2020. This tutorial is designed with a similar perspective facilitating a large number of business groups and IT organizations to create gen-next digital applications and perform real-time automations and benefit using UiPath to gain efficient business results. Intellipaat’s Robotic process automation tutorial is a complete learning package that lists its top features and help you know better about RPA and its tools processes and performance. The best of all- each and every topic is comprehensively illustrated using real-world and day-to-day business operation examples. 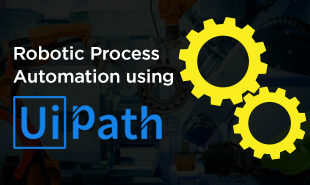 You can even take quick and appropriate business decisions by implementing the automation techniques of RPA using UiPath, which can ensure reduced cost and overall growth of your organization. Become RPA Certified in 24 hrs. There are no prerequisites for taking this training course. If you have a basic understanding of software coding and programming logic then it is beneficial. "0 Responses on Robotic Process Automation Tutorial – Learn Robotic Process Automation from Experts"
Sign Up or Login to view the Free Robotic Process Automation Tutorial – Learn Robotic Process Automation from Experts.